How a Dog Saved a Man. A Story of One Online Business. How to turn your hobby into a profitable business? What are the main lessons to learn before starting a business online? How to know whether the blueprint you are buying is worth the money? An interview with an online entrepreneur Chad Thompson. There are moments in life which at first sight seem quite ordinary. You met a new colleague. Had a nice chat with a fellow passenger on a train. Adopted a dog that was about to be put down. It’s only in retrospective when you realize that these moments were actually the turning points of your life. The new colleague became your husband. The fellow passenger, your new boss. And that dog nobody wanted earned you 10 grand. Sorry, not $10,000. It was $100,000. Otherwise, true story! 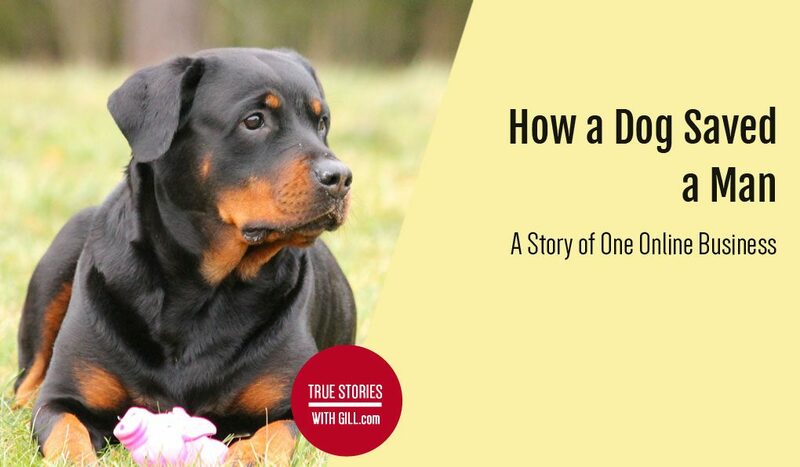 Meet Chad Thompson, who used to have a job in publishing, till one day he adopted a 50 pound Rottweiler with behavioral issues named Bella… and earned $100,000 by creating an online business around dog training. Needless to say, he doesn’t work in publishing anymore. Using his experience of turning a hobby into profitable business, Chad became an online entrepreneur, a copywriter and a marketing consultant. Nowadays he creates online businesses in targeted niches which he then sells for profit to start working on a new idea. Yet, when Chad told me he wants to tell his story on my blog, I wasn’t too keen on it. See, Chad believes everyone can turn their hobby in a profitable business. And I believe that it’s a matter of luck and other favorable conditions (in Chad’s case, being young, well-educated and single). Well, at least I used to believe that, because Chad makes a very compelling case proving his point. You know how some things seem too good to be true? Like for example, a rich and successful guy ready to answer any of your questions (any questions!) about online business giving you concrete numbers and revealing specific strategies with no strings attached, not even promotion or links to his websites. A sceptic that I am, I almost passed on this opportunity. But after Chad and I started talking on email, I realized that altruistic rich and successful guys who simply want to help people follow their dreams do exist. With all this being said, get ready for the most helpful article on online business you’ve read lately, especially if you are a newbie. Gill: Chad, in what place in your life were you on the day you rescued Bella? Chad: It was 2005, I was 25 years old, single and living in Washington, DC. I had a job that paid well, but I wasn’t happy. I didn’t feel like it had much meaning or made an impact. I had friends, went out, and had fun. But I distinctly remember this angst come over me every Sunday night about having to start the long work week again. And I dreaded it. Gill: Is it common for you to make spontaneous decisions like that? Chad: Not at all. When I make a major purchase, I spend weeks or months researching it. This was different, as Bella’s life had an expiration tag on it. It was to save her now or she will be gone. And a Rottweiler with obedience problems is not the dog most people would like to adopt. I felt like Bella was already my dog and I just needed to free her from the shelter. Gill: I’m afraid there is no other way to ask this (and it is quite possible your friends have asked you the same): What were you thinking taking an aggressive 50 pound Rottweiler home? Chad: Yes, almost everyone asked me that. I don’t want to sound cheesy or ridiculous, but I felt like this dog was asking me to take her. Her eyes were so expressive – and pet owners will understand this – as if she was talking to me with them. I noticed when others would come up to her cage, she didn’t look at them at all. But every single time when I passed by, she got up, came over to the front and looked at me. It was like we had some kind of connection. I almost felt like she was already my dog, and I just needed to free her from this shelter. Gill: Did you have a dog as a child? Chad: Yes, in fact, I did. A little gray-and-white Poodle named Buttons. And all my life since I knew that I would own a dog one day. I love dogs. Gill: How were your first days with your new friend like? Chad: Exhausting. Physically and emotionally. I took a week off from work to get to know Bella. But I didn’t really know how to train a dog. And I didn’t know if something might cause her to strike out at me, so I was often concerned. I spent those days taking her on two walks per day, at least 3 hours each, with some running mixed in. If I knew only one thing about dog training, it was that a tired dog was less likely to get into trouble. And I spent the evenings reading everything I could about dog training. Gill: You didn’t find anything that worked for you from what other people were suggesting? I would imagine many dog owners face similar problems. Chad: I didn’t find anything besides “seek professional advice from a professional dog trainer”, or advice on what to do if you came across an aggressive dog that wasn’t yours, which didn’t apply. I didn’t think hiring someone to work with her would help. I even worried they might report her as an aggressive dog or tell me she should be put down. After a lot of rounds of trial and error the results of which I wrote down in a journal, I developed a particular strategy that worked for Bella. It combined the way I approached her (letting her come to me, showing that I’m not a threat) and the walk, which I think people often underestimate but which is a critical part of the training. I cannot stress enough what walking for an hour with a dog does for her. Since I worked at a company that published mental health information, I knew that exercise was a reliever for depression and anxiety. So I thought, maybe this applies to dogs as well. The more time you spend creating content and engaging with people in your niche, the sooner you will become recognized as an expert. Gill: How many hours per day were you spending on posting and research? Chad: I’d be home from work at 5:30pm, start researching around 6pm and stay at my desk till midnight. I would spend around 6 hours a day researching, printing articles to read them later on the train, and learning what other owners’ most difficult challenges were. Every single day for months. After some time, I knew I wanted to create a sustainable business that would replace my current salary. So I was posting one highly valuable piece of content each day, which would take about an hour. That was priority number one. Then I would spend another 2-5 hours a day reading other articles for ideas and writing shorter posts to engage with people in communities and on forums. I would write shorter articles of about 400 words and post them in article directories like GoArticles.com or Ezine.com (I’d just google article submission sites), or on forums that were related to my niche. I also guest-blogged. I would email people, show them a new blog post I’d written and ask them if they’d run it. The time one puts in depends on the motivation to start gaining readers or making sales. But at a minimum, I would find an hour to create a great post. Gill: How would you find ideas for the posts and the articles? Chad: I would write something I knew people were searching for. I would use keyword research tools like Google Keyword Planner. I’d also pay attention to questions people posted in Yahoo Answers and forums. I spent time in the community just listening to what others were struggling with. I would often post a question on a forum, asking people about their biggest challenge in training their dog. I’d get 50 replies, compile them, and write content specific to each one. I would create a well thought out post and see results immediately. The high value I was providing kept people coming back each day to learn more. Write an article around very targeted keywords – it will outrank the articles from bigger sites on a broader topic. Gill: Did you promote your posts on social media? Chad: Social media didn’t play a role in the success of the business. I have also never paid for an ad on another website. These people found me organically while searching for answers online or got impressed with how thoughtful my answers were on the forums and went to my site. Additionally, just for signing up, I gave away a free 8 week training program that covered simple commands to dog on dog aggression. Each week was devoted to a problem people were searching online to solve. Then in the middle of the week I would send an automatic email checking on their progress and mentioning the paid products. Gill: How did the people find your website then? Chad: They found me while searching online for the answers to their own problems, using search engines or searching on forums and article directories. What many don’t know is that an article targeting a very specific topic would outrank the articles on a broader topic, even if they come from a bigger website. If you manage to find very targeted keywords and write a piece of content around them, it will rank higher in the search results, because it gives the readers exactly what they are looking for. I also spent time on dog training forums and Yahoo Answers. I set up an email notification for questions people asked about dog training. I would go through other answers, often very short, and post an answer that was very thorough. Not only did the person who asked the question notice, but so did all the other commenters. Also, if somebody else googled for a similar question, the thread from Yahoo Answers would come up high in the search results. And every time I posted on forums or Yahoo Answers people could see my profile with the link to my website. Gill: How many blog subscribers did you have? When things were in full swing, I had a list of about 5000 regular blog readers which grew to over 12000 at its peak. At that point, I noticed people asking very specific dog training questions over and over again. So I decided to branch out, start several sub-niche sites on topics like ending dog separation anxiety, for example, and my lists were segmented out based on what people were interested in. Key to successful online business: Identify a problem, provide valuable information for free, and then offer extremely high value products. Gill: When and why did you decide to write an ebook? Chad: People noticed the transformation of Bella. Friends, family and neighbors started asking me to help them with their dogs. So I thought, instead of dealing with all these endless requests from individual people, I could put it in writing and help people across the world all at once. Later, when people from the US to Asia were buying my books, it made me feel like I was doing something powerful, helping many people from all parts of the world with their problems. And that’s how online businesses become successful: Identify a problem you can help solve in someone’s life, provide valuable information for free, and then offer extremely high value products. Gill: How long did it take you to write it? Chad: It took me about 5 months. I was working full time, so I wrote at nights and throughout the weekends. And yes, I didn’t have much of a personal life at that time (laughs). Gill: Did you have any external help (editor, cover designer, etc.)? Chad: I know my strengths and I know my weaknesses. So I hired a graphic designer to create the book cover and hired a company to build the site so I could simply log in and add new content or products. Stick to a plan and don’t expect that you are going to put up a site and start making sales the next day, or even the next week. Gill: How much did it cost you? Chad: I paid $1000 to have the site built, and paid $100 for the book cover. I got the other images for the book by looking for free images for commercial use online. I didn’t buy an ISBN, as it was just an ebook. Besides, I wanted to keep it simple and not to pass on printing costs to customers keeping my prices affordable. Overall, I spent $1600. That was for the site, for the graphics, and for hosting/domain name. I also hired a VA (virtual assistant) to do some admin work, got a PRO Paypal account and paid the programmers a couple of times to get things on the site changed. That was it. The rest was all free promotion using the methods I mentioned: writing for the article directories, engaging on forums, linking to my site from the other sites. Gill: Were you selling your book only from your site or also from the popular platforms like Amazon? Chad: I sold it exclusively from my site. Back then, I had no idea how to publish on Amazon. I thought you had to be an author with a book deal and a publishing company backing you. I was not entirely familiar with creating online business and was just doing what I thought would get my content out to as many people as possible. Now it has a name: Content Marketing (laughs). Gill: How much time passed till you noticed the substantial sales volume? Chad: Eight months. Which is why I tell people to stick to a plan and understand they are not going to put up a site and start making sales the next day, or even the next week. Now I can start making sales in a month, but that came from a lot of trial and error, self-education and new technology like keyword research tools, advanced email auto-responders, advanced software for building a website, tools for statistical analysis, plug-ins for sharing the content on the social media, etc. Gill: You say you were a newbie and didn’t know much. How did you know your plan is going to work eventually? Chad: Because once I started making sales, I knew people were paying attention. I saw that my content was getting more views. And the longer the content was on the Internet, the higher the numbers of views would get. Naturally, with more traffic more sales took place. I figured, well, more content means more views and more traffic. It was a very unsophisticated plan for sure. And once I started offering a “refer a friend” program and became more familiar with keyword research and SEO, I saw significant changes. Start a business you are passionate about and can write about daily. Gill: Are you still in the “Bella business”? I’m not anymore (it’s a long story), but I do have a simple site with articles, a sales page, and the mini-course providing dog training. The success of that “Bella business” changed my path towards being a copywriter and marketing consultant. And even that’s changed into owning a portfolio of these “niche sites” that offer people solutions for their specific problems. I just launched a series of sites including a back pain blog, a skin care line focusing on anti-aging, and a travel site that helps people save money and find great deals, which also has the stories from places I’ve visited. I even have a face painting website that sells courses on how to paint cool animals or designs on children’s faces. So I try to build businesses around things I’m interested in and can offer some guidance…yes, even anti-aging (laughs). I’m always creating, earning, or selling. I rarely look to hold a site forever, because things change so much online. And I have more ideas I want to work on. That’s important: Start a business you are passionate about and can write about daily. But it all started because I wanted to be a responsible dog owner that had a dog people weren’t afraid of. I owned it to her the day I took her home, as she rescued me as much as I rescued her. Gill: You were saying that providing high value content is vital. While starting your dog training business, you’ve been researching 6 hours a day. Now you have many such sites. Who provides content for them and how do you ensure its high value? Chad: I still write every day. But I’m fortunate to have freelance writers writing content for me. I proofread it and send it back if there isn’t valuable information, something in it that people can use to make their life easier, better, solving an issue, providing ideas, etc. Gill: Now, when you’ve learned so much about it, how much time does it take you to turn one of these niche sites into a profitable business? Chad: It takes about 30 days to make the first sale. But there is probably 2-3 months of work to do before it goes live. I have 25 blog posts written, I have the product descriptions and the payment processing system in place. So when the site goes live, it looks updated and not like something that is under construction. To test a site, I would send targeted traffic through Facebook ads to it to see how it converts. If I don’t see 5 sales per 100 visitors, I stop and find out why they aren’t converting, tweak some things based on their behavior on the site. For example, if the people land and leave in 5 seconds, it means I’m not getting my message across fast enough, so I change the headline. Gill: What were the main lessons you’ve learned from your experience? Chad: Well, I’ve learned a lot about dog training, that’s for sure. And that if you know what to do and have the time to make an effort to do it the right way, your business will succeed. 1. Do your due diligence. Don’t assume because you love something, there is a full time income in it. Generally speaking, there is money in everything. But understanding things like keyword research and conversion rate optimization will show you how exactly you can use your interests to build a profitable business. Build businesses around your interests, not the latest trend. Otherwise what you were once passionate about will make you feel as if you still had that 9 to 5 job. Make providing quality information for free your main priority. As soon as you have a digital product you think people will pay for, give it away for free. Blow people away with it, and they’ll want to know how great your paid product is. Acquire industry knowledge. Learn new marketing strategies. Read great blogs about online business. Learn what the others are doing in your niche. Listen to the feedback. You are the worst person to judge your ability and performance. Don’t ever think you’ve figured it out. Don’t leave emails unanswered. Respond to people that comment on your blog. Offer help. Go above and beyond for people. Keep in mind that they are giving you their hard earned money. Make it money well spent. 6. Get rid of your monetary expectations. Do it because you enjoy it, not because you think it’ll put you on a beach some place counting your riches. Be patient. This is a real business. You can’t just set up a site, post on a blog once in a while and expect things to happen. 7. Cure the shiny object syndrome. You’ll get overwhelmed with the blueprints for success and may easily get distracted. One day it’s eBay; the next, it’s publishing on Amazon Kindle; the day after, using Fiverr. Stick to one plan. Otherwise you’ll find yourself constantly starting new and, thus, not moving forward. Gill: So you do recommend buying an online course to speed up the process? How do I know what I’m buying is worth the money? Chad: It’s the claims. If they are too good to be true, then they are not. If you don’t see any value on the site through blog posts and free information, you don’t know what you are getting. But if they show you examples, things that you can do today that help, you can bet their product is good. Gill: You specialize in the niche businesses. Do you think the same strategy would work with a product from a wider niche (for example, food recipes)? Chad: It’s all the same process. Ultimately, if it’s something like food recipes, do your keyword research so you know what things around the food recipes people are searching for but can’t find due to the gaps in the market. You can use Google Keyword Planner to discover such keywords. They will have high search volume, but low competition. Then it becomes about the brand. What does your brand represent? How are you – not your niche, but your product – different? Why should someone read your recipes or try them over the household names? For example, maybe you have ebooks on 4 ingredient recipes. Cookbooks for bachelors. Recipes to make lunch from left-overs. A small piece of software where you can enter 20 things you have in your fridge right now, and it will suggest you a recipe to make. And so on. Usually, this would be the time and place where my interviewee answers the questions from the audience. But since we got so many interesting questions and Chad has given such thorough answers, I decided they deserve their own spot light within a follow-up post “How to Build a Successful Online Business with a Family and a Full-Time Job?”. Don’t want to miss the next post? Get it delivered to your inbox! Previous post Learning a Language: The Best Way Is the Fun Way. A Story of One Project. Next post How to Build a Successful Online Business with a Family and a Full-Time Job? Gill, your article is amazing. Really practical and good advise. Thanks for not giving up on Chad and for being able to get all the valuable information from him and present it to us is such a well organized way. Please, send my thanks to Chad too for being willing to help others. I am definitely going to use many of the recommendations from the article. Thanks do much for the offer Chad! I will contact you if I have more questions after the 2nd and 3rd parts from Gill. You are very inspiring, but I have to say that what moved me the most is the fact that you decided to save a Bella knowing the challenges you had ahead. Many people are willing to make big sacrifices to develop their own business but not too many would sacrifice their way of living to save a dog. BTW 3 hours walk twice a day is a big one, even for an exercise and outdoor lover like me! LOL All the best and say hello to Bella! 2. to find some interesting ideas like not to get distracted by “the blueprints for success”. But in this regard I would add that it’s useful to experiment and then see the results (if you have enough time). Without ever stopping to update our content regularly, we have tried many different options and are still checking more of them, changing and developing our website. Overall I agree – as long as you’re passionate about what you do, you can achieve great results. What a great interview. Gill, I stopped by because I thought it might help me with the interview we are working on and because it just felt like the right thing to do. And Chad, I’m glad to meet you through this post. And what I gained the most from it is that I am already doing most of the things that will make my online businesses successful. I just need to keep doing them, be patient, and continue to focus on solving problems or answering questions. In my business where I help people sell amusement equipment the problems are finding new bookings, locating new vendors for equipment and insurance, finding qualified employees. For my new coaching business I just need to keep sharing my experiences and letting them know that I have been through what they are going through and that I can help them. I’m especially encouraged by the fact that you didn’t sell your ebook on amazon. Mine is currently for sale only on my website. I’ve sold three copies in the first month which doesn’t sound like a lot; but it feels much more impressive after reading about your experiences. I would love to hear any thoughts you might have to make my efforts return more financial rewards to go along with the professional success and personal satisfaction. Thanks for sharing about Bella and your business. And to Gill thanks for starting this site and these posts.